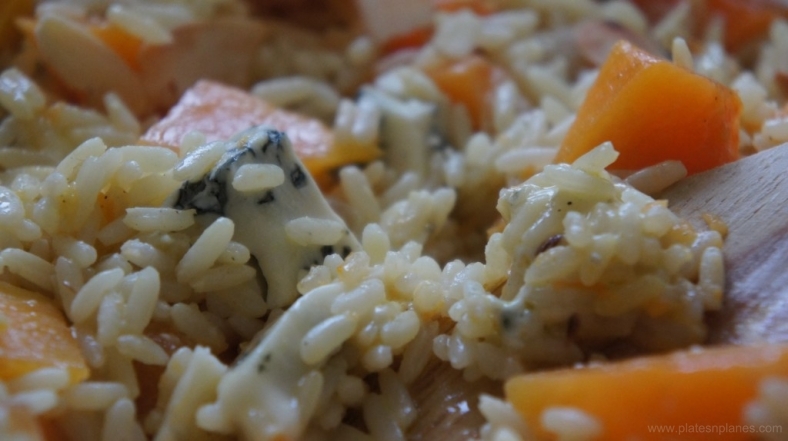 I tried several variations of risotto with pumpkin, but this combination with gorgonzola is my favorite. 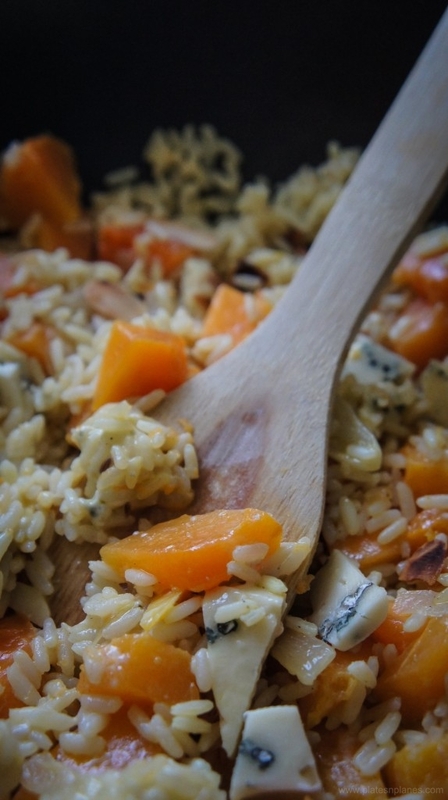 The recipe originates from Italy, but I changed a bit through time and added to it my personal touch.In this yummy risotto rice is laced with pumpkin and gorgonzola. What I love about this recipe is contrast in the balance: butternut pumpkin has sweet, nutty taste and mature gorgonzola’s “sharp”, salty and pungent flavor ( added in just right amount ). Also combination of colors are simply heavenly: intensive and shine orange pulp of pumpkin mixed up with blue veined gorgonzola. Put the olive oil and the butter in a large saucepan and heat it at medium heat, add sliced onion and garlic and stir until onion is soft and glazed. Than add in cubes of pumpkin (1.5cm) fry it for a few minutes stirring occasionally. After that add rice inside and stir until all rice is covered with mixture ( there should be not dry grains of rice). Stir it all the time while slowly adding vegetable stock. Cook the risotto slowly, until liquid evaporates – it must be creamy, but rice should be firm inside. Because of that you have to stir continually and check the rice every now and then. Finally add crumbled gorgonzola. Again stir gently. How to prepare vegetable stock? Heat the oil in deep pan, add sliced onion and stir it until golden, than add( sliced )the rest of ingredients and 1l water. Boil for 5 minutes, than cook on very low fire for 45 minutes-1 hour. Drain it and take away vegetable, liquid that remained is vegetable stock.